Picking from some of the best current sustainable design the world has to offer, we profile a floating passive house currently moored in the Netherlands, a ground-breaking timber hybrid tower in Austria, a multi unit passive scheme in Malmö, and an Enerphit upgrade to a brutalist Connecticut home originally designed by one of Frank Lloyd Wright’s colleagues. Here's something a bit different — a floating passive house in Maastricht, the Netherlands. And not only does it float, but the 'Autarkhome’ produces its own electricity, collects its own drinking water and even cleans its own wastewater. 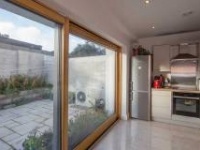 Built from reinforced concrete with rigid foam insulation externally, the house has everything you'd expect from a passive house: triple-glazing, heat recovery ventilation and exceptional airtightness. But this off-grid pioneer takes things way further: for a start, it can collect water right from the surrounding river and treat it for drinking with osmosis, sand and UV filters. Twenty four solar photovoltaic cells provide electricity, with a biodiesel generator acting as a back-up on cloudy days. Solar thermal collectors feature too, and the house even has its own wastewater treatment facility. This prototype was conceived by renewables firm IBC Solar BV and Maastricht-based architect Pieter Kromwiljk along with a long list of partners, and it has proved so popular that IBC is now planning to mass produce it. Construction took nine months, but the company says once mass production starts Autarkhomes could be built in less than half that time. IBC Solar BV's Peter Meijers told Renewable Energy magazine last year that the design could be particularly popular in places where there are plenty of rivers and lakes but limited land space for housing. Can you turn a 1934 modernist home into a passive house without destroying its character? Judge for yourself. One time Frank Lloyd Wright employee Barry Byrne built this brutalist classic in 1934 for the pianist and comedian Oscar Levant. 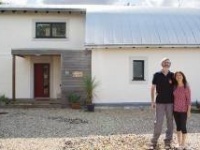 At one stage it was threatened by demolition, but passive house designers and contractors MudaGreen have wrapped it with recycled glass insulation and achieved Enerphit certification, the new Passive House Institute standard for retrofit. But the house is more than just energy efficient: MudaGreen's Doug Mcdonald avoided the uses of "red list" chemicals, chose fast-growing bamboo for the floors and installed solar thermal panels for hot water. He says the original design of the house was "amazing even for today's family", and that he only had to remove two interior walls during the refit. He describes the house as "carbon free" because it runs on a renewables-only electricity tariff, so the only carbon burned is by its owners' cars. 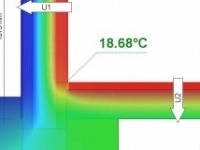 The concrete frame that once acted as a giant thermal bridge now provides thermal mass that helps to smooth temperatures inside by absorbing heat and releasing it slowly. The landscaping requires no fertiliser or additional water beyond rainfall. Has it changed the character of the house? Some will say yes. But historic houses need to be liveable in order to survive into the future, and this retrofit seems to update — rather than alter — the house's modernist character. The western harbour of Malmö was once an industrial district of factories and shipyards, but today it is a hub for urban regeneration. The University of Malmö opened here in 1998, and three years later the area welcomed the Bo01 (Live01) housing exhibition, which saw 350 apartments constructed to showcase a quality, high density urban district rich with public spaces and architectural diversity. Bo01 is largely wind-powered, cycle tracks criss-cross the zone, and buildings here are heated by a combination of roof-mounted solar panels and Malmö's citywide district heating network. There's an ecological approach to landscaping too, with green roofs, a network of waterways and nesting boxes for birds. The area has its critics though — some say it has become too reliant on cars, that overglazing means some buildings use too much heat, and that property here is only affordable to the rich. In 2009 veteran passive house architects Kjellgren Kaminsky won a competition to develop a four unit residential passive house complex, called Salongen 35, on Bo01's last vacant site. Aside from its energy efficiency, the development boasts other green features: solar thermal panels, green roofs and walls, FSC-certified timber throughout, low water taps and greywater recycling. Each unit is also clad with a different material — plaster, cement board or wood — to give it a unique character. LCT ONE was completed in 2012 and is an example of architect Hermann Kaufmann's goal of developing timber construction over the course of decades of working with the material. Kaufmann has been designing passive houses since the 1990s in the harsh climate of Voralberg, Austria. This office building is an eight-storey low energy (13 kWh/m2/yr) hybrid construction clad in a beautiful reflective skin. The detailing is crisp and minimal. Modulation of the facade is restrained to an expression of the vertical circulation core, and framing of the ground floor entrance portico. The timber columns and beams are expressed inside, softening the aesthetic along with a playful use of colour which highlights certain aspects of structure, sometimes accentuating it and sometimes suppressing it. There is a masterful use of decorative timber linings in the entrance foyer and in parts of the fit-out. 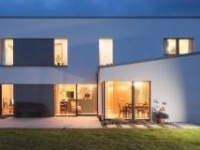 Project architect Christoph Duenser will give a lecture in Cork on 13 June, and it promises to be a master-class in the design and execution of passive house commercial projects with low environmental impact. Duenser will also present another in-progress office project on the night that is due to be certified passive. Professionals and members of the public would be well-served in attending this sneak-preview of where the Irish architectural profession should hope to be in the next decade.